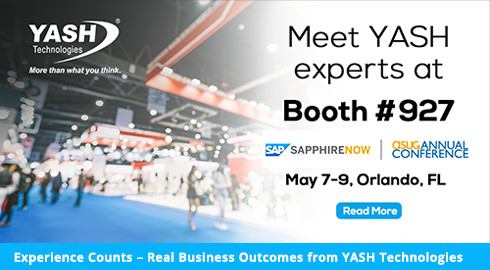 Hyderabad, 8th April 2019 : YASH Technologies, an SAP® partner, today announced that it will participate at SAPPHIRE NOW® and ASUG Annual Conference being held May 7-9 in Orlando, Florida in booth 927. YASH will be demonstrating several innovative solutions and prototypes including its highly regarded proprietary framework – LiveFactorysm. YASH will also be unveiling it’s next-generation Application Managed Services framework during the event. Experts from YASH will demonstrate immersive technologies and live demos in the booth to provide visitors with personalized Digital Transformation roadmaps for their organization. These solutions allow customers to experience real-life scenarios to help them understand how YASH’s industry and SAP expertise drives real business outcomes. SAPPHIRE NOW and ASUG Annual Conference is the world’s premier business technology event and largest SAP customer-run conference, offering attendees the opportunity to learn and network with customers, SAP executives, partners, and experts across the entire SAP ecosystem. YASH Technologies focuses on enabling its customers to succeed and drive IT Business Transformation. As a leading technology integrator and outsourcing partner for large and fast-growing global clients, YASH combines operational and IT technology with flexible business models to enable value-driven innovation throughout client enterprises. YASH customer-centric engagement and managed services delivery framework integrates domain expertise and consulting capabilities with proprietary methodologies to provision application, infrastructure and end-user focused Right-Sourcing services. Headquartered in the U.S, with delivery and sales centers globally, YASH serves its customers across six continents. YASH is an SEI CMMI (Level 5) and an ISO 9001:2015 certified organization. SAP, SAPPHIRE NOW, and other SAP products and services mentioned herein as well as their respective logos are trademarks or registered trademarks of SAP SE (or an SAP affiliate company) in Germany and other countries. See http://www.sap.com/corporate-en/legal/copyright/index.epx for additional trademark information and notices. All other product and service names mentioned are the trademarks of their respective companies.